CALIFORNIA 44 • SHOPPING CENTER BUSINESS • September 2018 posed retail and residential project on the site of a former Fresh & Easy building in Signal Hill, as a prime example. The mixed-use development headed up by Signal Hill Petroleum (SHP) and Vestar calls for 42,800 square feet of retail, 199 apartments, four single-family residences, a parking structure, a "Main Street," an outdoor plaza and community gathering spaces for events like farmer's markets or movies in the park. KTGY is designing the seven-acre site, which sits adjacent to the Signal Hill historic district, as a new city center and downtown — something Perkowitz and his team feel is lacking in the area. Heritage Square isn't the only project to move away from big box and toward multi-function. Derrick Moore, senior vice president of CBRE in Downtown Los Angeles, has wit- nessed this trend throughout the state. "Those leaving vacancies will likely con- tinue to be big-box retailers that failed to create meaningful experiences and con- nections with consumers," he says. "Con- venience is more important than ever, giv- en many people's busy lives. That's where the live-work-play concept has become more relevant, driving demand for mixed- use developments where residential, retail and office converge." Co-working spaces have gained par- ticular favor with California landlords as they look to replace certain soft goods that are now commonly purchased on- line with necessary services and unique experiences. "One of the most interesting trends we're watching in malls and with big- box space is co-working," says Karl Thompson, project manager at CRE- Models. 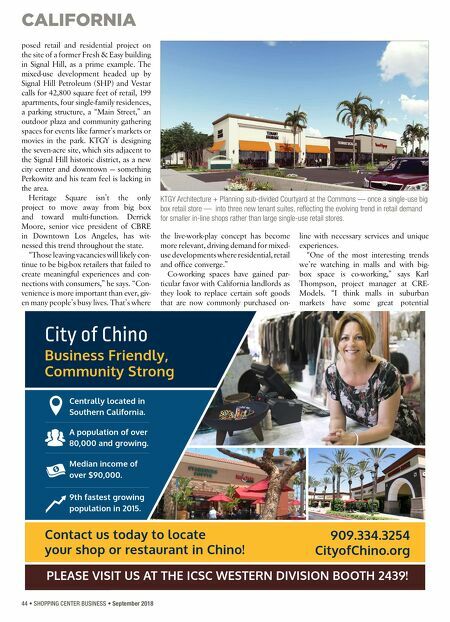 "I think malls in suburban markets have some great potential City of Chino Business Friendly, Community Strong Centrally located in Southern California. A population of over 80,000 and growing. Median income of over $90,000. 9th fastest growing population in 2015. 909.334.3254 CityofChino.org Contact us today to locate your shop or restaurant in Chino! 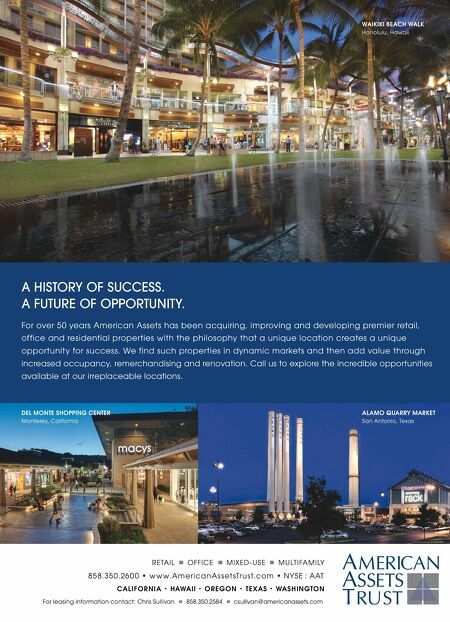 PLEASE VISIT US AT THE ICSC WESTERN DIVISION BOOTH 2439! KTGY Architecture + Planning sub-divided Courtyard at the Commons — once a single-use big box retail store — into three new tenant suites, reflecting the evolving trend in retail demand for smaller in-line shops rather than large single-use retail stores.